A gamer knows the importance of having a proper joystick as it enables you to have full control over your gaming sessions. When you are on your PC or PlayStation, you definitely do not want to ruin your game in any way. Thus, joysticks for PC are needed for winning the game with the best moves. Giving you an actual pilot-like experience, you will be filled with thrill and adventure while exploring the advantage of these controllers. Further, good resolution and control is a must-required feature. Well, there are numerous other points that make a joystick ‘the best’. Do you want to know that which features must be considered in a joystick? Well, our list of top 10 USB joysticks for PC Games reveals it to you. 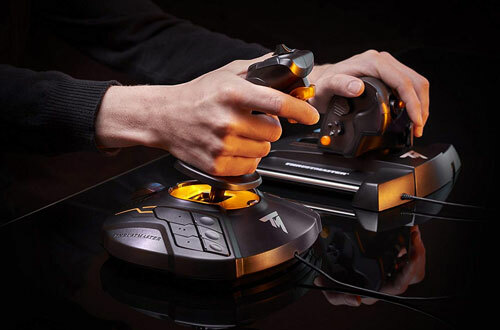 Thrustmaster’s T16000M is the perfect flight control simulator that professionals can get instead of a mouse and keyboard. Using a mouse and keyboard for flight simulation is like playing football with a basketball. It doesn’t give you quite the right sense and calibration you need. 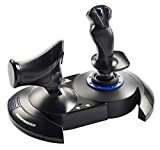 Thus, using this joystick is a breeze and has no compatibility issues with a regular PC since it connects with a USB. You get optimum precision with the 16-bit resolution since it can process 16000*16000 values to react quickly and accurately. The throttle alone is designed to provide great comfort and ease of use. Further, it has a lower position which is less taxing on your wrist and has 16 action buttons along with an 8-way-PointofView hat switch like the FCS. 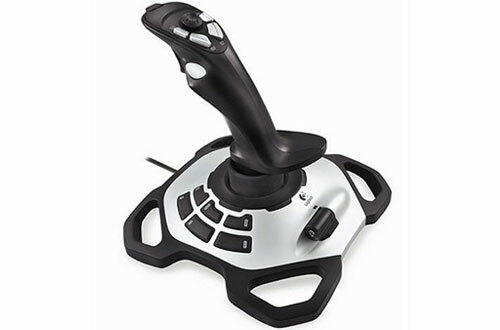 Also, this joystick for PC games features Hall Effect accurate technology 3D that even includes magnetic sensors. You get Thrustmaster’s advanced programming software T.A.R.G.E.T. Light, weighing just 3 pounds. It’s a combo unit where you get both the throttle and the joystick integrated as one unit but can be separated if you want. As a matter of fact, it’s a budget joystick with a performance that leaves premium joysticks in the dust. You can easily use it with dual platforms. It can be used with your PS3 or your custom PC. On the weighted base, you have a button that lets you switch this quickly within a second. You also have 5 more buttons here including the home button, mapping, select, reset buttons and more. Moreover, on the joystick, you get a mapping button to facilitate the switches. And the high-precision product allows adjusting the resistance. When you put this in your hand you will be amazed by how fantastic and rugged it feels. The throttle will give you the feeling that you can max out and launch all boosters in the world. You can map your own functions on the buttons. Have a total of 5 axles and 12 buttons. The internal memory of joystick allows it to save your setting even when the joystick isn’t connected. 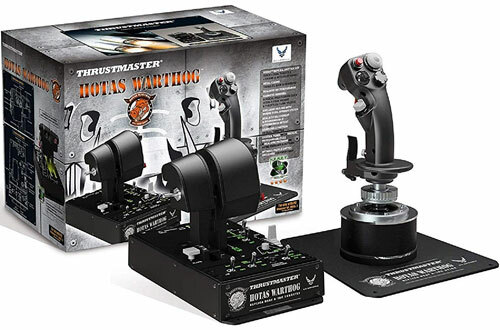 Thrustmaster is an expert brand when it comes to flight simulation controllers. They have decades of experience in the field and have been perfecting and polishing their product to greatness. This is one of those ingenious products. Just the joystick has 19 buttons and it has an 8-way hat switch on the joystick and a rugged trigger that can take a lot of abuse. Having a full metal construction, the joystick along with the metal plate is detachable. Next, it comes with a dual throttle system and even has a metal hand rest. The H.E.A.R.T or Hall Effect Accurate Technology has magnetic sensors integrated into the stick. With 16-bit resolution as well as 5-coil spring system, one will also get three different levels of programming with T.A.R.G.E.T. Not only does it have inbuilt presets but the users can also create their own presets. The control panel includes 5 LEDs which are further programmable. Logitech has always been a very reliable and endearing brand for both gamers and PC users. The Extreme 3D joystick is one such time-tested product that has made its users happy all over the world. 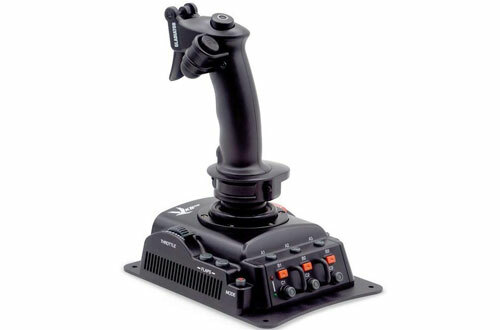 With an extremely affordable price tag, high-durability and longevity it, is going to be your best bud when you are on flight sims joystick for PC. It has a stable weighted base that firmly rests and won’t wobble with a bit of rough use. Further, it doesn’t matter if you are playing a commercial aircraft simulator; a fighter jet or an alien spaceship, the 3D Pro takes care of it all. You get 12 buttons that have well thought out positioning and a button for rapid firing those lasers and missiles. Rudder control and twist handle are extremely precise as well as accurate. Having this joystick, your enemies would dread you with your improved gameplay. Buttons can be reprogrammed and customized. Hat switch goes 8 ways. 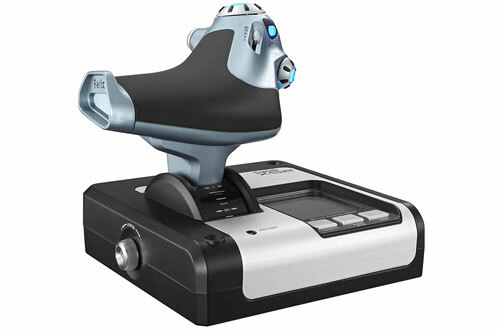 Logitech’s Saitek controller has been giving the competition a run for their money for a long time and for all the good reasons. The looks alone would get you hooked to this control system. It has a very sci-fi look that gets more enhanced with the LED lights. Even the controls are very precise and you can use it without getting fatigued for long hours. 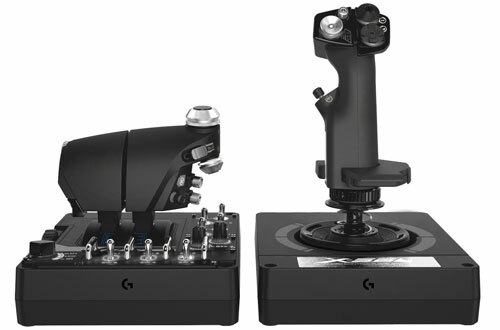 Plus, it has two separate controllers, one for movement and another for throttle. Given that, it has multiple buttons on both the units and has nice blue LED to complement them. You can also adjust to dim or brighten the lights through the programming software. Also, the handle promises adjustments to five different positions and the contoured finger grip enhances the gripping. Finally, you can set up three different profiles too. Have two triggers, one high and another low. Nice rudder controls as it has 3D twists. The throttle has a display uses to display important info and mapping profiles. Also, the tension dial aids in making adjustments. You might live civilian aircraft or combat aircraft with this feature-packed system that would fit your profile and preference without any issues. The resistance of the stick is adjustable and it features a nice hand rest for prolonged gaming sessions. In the flight gear, you get a rapid-fire trigger, 12 remappable action buttons and 5 axes. The best part about this joystick is its ergonomics. It is so well balanced that you will never feel any discomfort even after long hours of usage. Moreover, it comes fitted with a large hand rest, meaning more room for your hand while you fight it out in the air. Having a throttle that is detachable, it even has the facility of positioning in two different ways. Compatible with all versions of Windows from XP to the latest Windows 10. Just by rotating the handle, the joystick’s rudder function is can be used. Platforms can be changed with a switch. 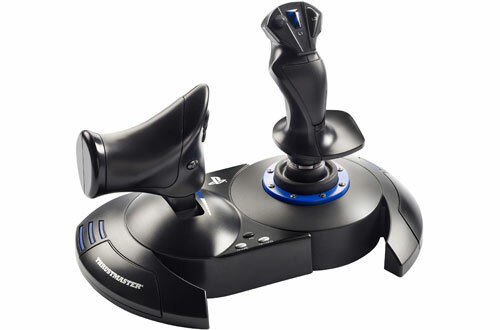 Thrustmaster has brought you two T16000M that make dual-engine flight and space sims even more fantastic. To increase the accuracy, they have provides 3D magnetic sensors inside the stick. This gives you over 250 times the precision than other products in this segment. Sudden halts and being stuck with a wobbling controller can get to the best of us. Furthermore, the magnet removes that extra friction that can come in the way of a good game. Moreover, since you will have joysticks on two hands there won’t be any compatibility issues if you are right or left handed. You obviously get the T.A.R.G.E.T software for free with which you can create custom mapping profiles for several games. Lastly, the hand rests are pretty wide and stability is assured. The Gladiator joystick is beast and deserves appraisals due to its immense convenience. 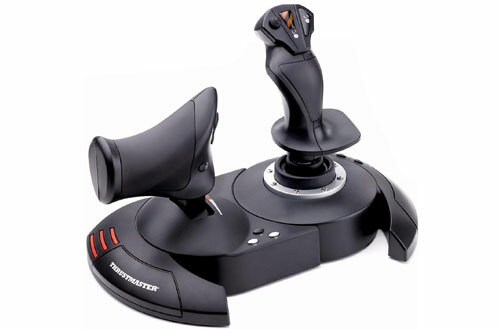 In this model, the design is enough for many flights simmer and enthusiasts to buy this incredible joystick. It is modelled after the famous flight grips of World War II-era fighter planes. Thus, the classic design has been integrated with modern technology by VKB to give expert players a real experience. Apart from the PC flight-stimulators, it provides an original grip. Plus, it has sensors that process incredible amounts of data and superior quality construction that gives virtual pilots quality and hassle-free experience. Well-engineered and built to last. 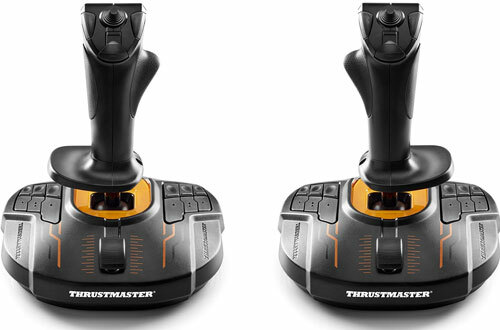 This flight pack from Thrustmaster is a technological marvel that can sweep away all the challenges that comes your way. 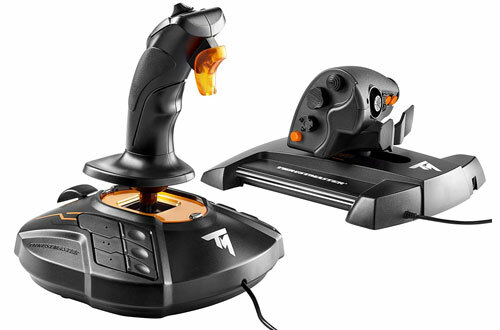 It has a flight stick, throttle and pedals making it a complete package for playing most games. Even it has realistic controls that make you feel like the rule of the sky. However, the best and probably most underrated part of this package is probably the flight rudder pedals. It is made of industry standard and high quality anodised aluminium which makes it really fit for rough use. Plus, it has quite a bit of resistance to it yet you will find that the sliding motion with the rails is super smooth. And it has achieved an unprecedented balance between those two elements to give you a brilliant product. Due to its H.E.A.R.T technology, you won’t lose precision with time. Flight stick has 4 axes that are independent of each other. Program the controls and make profiles for different games with the free T.A.R.G.E.T software. Your excellent gaming setup can never be complete without a reliable and premium joystick that can bring out your full potential. Logitech’s G X56 will help you achieve that easily. The whole package has high-quality construction and design with the buttons having a nice click to them. With the multiple 8-way hat switches, you will find every direction very defined and under your control. The triggers are big and nice and have a satisfying actuation point. Even the military grade space coupled with the precision of flight sim is amazing. Rudder and twist controls with the stick are really smooth and won’t fail to impress you. The throttle base alone is filled with knobs and flick switches that are quite tactile and are made to last for a very long time. RGB lighting that goes well with your RGB gaming setup. The throttle has firm and uniform motion. Over 180 controls that can be programmed. 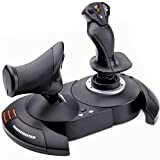 Let the gamer in you have the time of his/her life as the PC flight joysticks for sale will provide excellent performance.